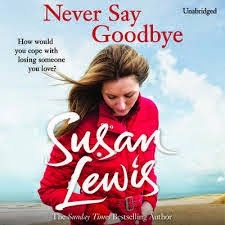 A few weeks ago, I wrote about meeting Susan Lewis, the author of Never say Goodbye. Having chatted to her, I have read the book and was most impressed. The book is about 2 women who live on different sides of a seaside town: Josie and Bel. Josie develops breast cancer and whilst Bel has never had breast cancer, her twin sister died from it. Bel is a volunteer for Breast Cancer Care and meets up with Josie. As the story develops, Josie's journey through the diagnosis and treatment of her disease forms the backbone of the plot. It was interesting to read about the experience of being seen by the surgeon from the other side of the desk. The relationship between Josie and Bel is not one way. Bel does support Josie but she also gets a lot out of the relationship. This is a common and real phenomenon that many volunteers experience. Over the years of treating women with breast cancer, I have had the privilege of reading some very personal accounts of their story. In my opinion, Lewis captures the emotional highs and lows of the journey in her insightful novel. I was impressed with this accessible novel. It is factually accurate and am sure that women who are going through the trauma of breast cancer treatment will be able to identify with the very real character, Josie.